Perhaps as you read this book, you will realise that you have already experienced the sort of things Mary Bowmaker is writing about, without ever realising this before. Are you living your true life – your best life – are you making the most of your talents, your abilities; are you HAPPY or is there perhaps a feeling of ‘something missing’? This book will enable you to prove for yourself what, deep down, you already know; your spirit is the real you; bring it to the fore, reconnect if you need to, it’s easy. An unexplained something that lurks at the back of your mind – a strange dream that you know must have a meaning, a message. ‘Well, there was ONE thing’…a phrase Mary often hears. It is our inner life that makes us what we are, and this book will help you to understand this great truth. Need a connection? Look to your inner self. 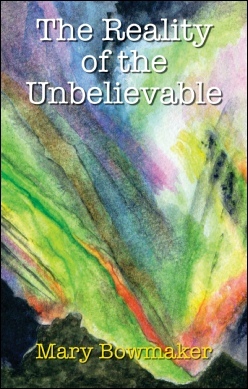 Fascinating stories, exciting, uplifting, perhaps unbelievable, sometimes sad; experiences of the so-called ‘paranormal’ (some of which are here recorded in this book) are happening every moment of life, somewhere, just as they always have, the difference being that we are now not ‘shy’ of telling them. For this is The New Age, the Age of Aquarius, a time for change with a capital ‘C’, and a feature of which is ‘openness’ in all areas of life; financial, social, political, religion. Openness, where we are not afraid to talk about our dreams, or an intuition, a feeling, that very special experience, or when we have seen an ‘angel’. What is your story? What are the experiences you have had in your interesting life? Think about it.